T-Mobile’s newly minted CEO John Legere continues making the media rounds in Las Vegas as the 2013 Consumer Electronics Show winds down. During an interview yesterday, Legere expressed his belief that T-Mobile will end subscriber losses by next year. In fact, Legere says that subscriber numbers “should be positive” in 2014 with “incremental” growth by the fourth quarter of this year. “It won’t be linear, but it should be sustainable,” said Legere. Guy Peddy, an analyst at Macquire Bank Ltd. in London believes T-Mobile will see 1.6 million subscribers lost in 2013 and another 400,000 in 2014. T-Mobile’s move back into growth rests partially on how well it can convince the world that Value Plans are the best opportunity for them to save money. However, convincing customers that Value Plans are the right move is just part of the equation as another missing link is added with the addition of the iPhone. Will it be enough? 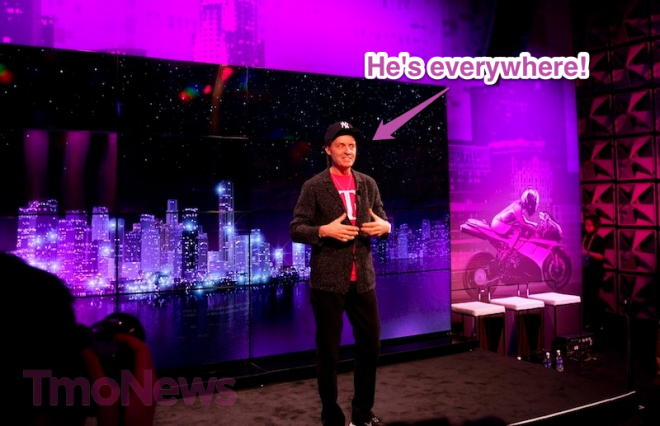 Maybe, but something tells me Legere is just getting started. I thought they said the iPhone would be available in the 1st quarter of the year.. that’s still true right? I wish they would at least give more details about it… Also I hope Tmo doesn’t end up ONLY carrying the rumored “cheaper” iPhone. There was a rumored “cheaper” iPhone 2 years ago just before the iPhone 4 came out. Keep in mind that most rumors like that are just to manipulate Apple stock for day traders. But it did come true as the 3GS became a cheaper option. Before the 4, there was only 1 iPhone model availiable and that was the high-end. Now we got low(iPhone 4) mid(iPhone 4S) and high (iPhone5), which before it was just high end model bieng sold. I believe that is what they’re doing. ****Glances at Apple’s iPhone sales figures**** BWAHAHAHAHAHAHAHA! Seriously. Just because a phone isn’t as strong as it once was doesn’t mean it is no longer iconic. Michael Jackson’s career declined significantly but that doesn’t make him any less of an icon. Because Sales are the only thing that makes a device iconic? What did I tell you about replying to me? I agree, the same thing happened the Moto Razor. At one point even TracFone carried it. Funny too because now Straight Talk, who is owned by TracFone, is now going to carry the iphone 4s and 5. See… the trend has already begun. Soon the iphone name will be the icrap. Customer service should be before advertising. Remember back in the day when they were #1 with customer service & everything else was #2, they might of been small but everyone was happy. And then they changed gears & dropped their award winning customer service in favor of…..well I have no freaking idea, cause whatever it was it failed BIG TIME. Right now they are trying to change their image through advertising, & sometimes seeing is not always believing. AT&T has none of the above only the iconic device and look where they are. I think you guys are really underestimating the power of the iphone everybody who doesnt know any better wants one of these. at the time the iphone was an at&t exclusive and android wasnt that popularity. that what help at&t. sprint thought getting the iphone back in 2011 was going to change things for them. even after getting it things were still bad for them. the iphone is still a popular phone, it just doesnt have that power it had a few years ago, especially since it on multiple carriers. If they try to kick old customers like me off their Classic plans, their subscriber numbers are not going to be positive in 2014 or any other year. These Value plans are just a $5-10 price hike in disguise, and people are not going to fall for it. You can talk about total cost over 2 years all you want, but nobody cares. All people want to know is how much does it cost upfront, and how much is the bill from month to month. And no, T-Mobile has NOT “gotten rid of subsidies”, they’ve merely separated them into a line item on your bill called EIP. In my case, the bill from a Value plan + EIP costs $10 MORE per month than my Classic plan, with no upfront savings whatsoever over purchasing a subsidized high-end phone from a T-Mobile authorized reseller. Can you show us the math? I would like to know how it works out that you’re paying more than you were before. My Classic Android voice-blocked data/messaging plan is $49.95/month. Supposedly, the equivalent Value plan is $39.95. The EIP on the Samsung GS3 I bought a few weeks ago was $20. Add the $20 EIP to $39.95 and you get $59.95/month. The upfront cost of the phone was only $48 + tax at Walmart, I think its about $99 at my store, now. I also had to pay an $18 upgrade fee that showed up on my bill later. The down payment on a Vlaue plan GS3 was something like $149 or $199 at the time – I don’t know what it is now. T-Mobile’s website deliberately obscures pricing of both phones and plans for some scenarios, so I can’t even tell you what a GS3 costs today on a Value plan. My Classic Android voice-blocked data/messaging plan is $49.95/month. Supposedly, the equivalent Value plan is $39.95. The EIP on the Samsung GS3 I bought a few weeks ago was $20. Add the $20 EIP to $39.95 and you get $59.95/month. The upfront cost of the phone was only $48 + tax at Walmart, I think its about $99 at my store, now. I also had to pay an $18 upgrade fee that showed up on my bill later. The down payment on a Value plan GS3 was something like $149 or $199 at the time – I don’t know what it is now. T-Mobile’s website deliberately obscures pricing of both phones and plans for some scenarios, so I can’t even tell you what a GS3 costs today on a Value plan. OK, here’s a simple example for a Samsung GS3 with 500 Min Talk + Unlimited Nationwide 4G. The Classic plan rates for work out to 39.99 voice + $30 data = 69.95/month. The Value plan rates are 34.99 voice + $20 data + $20 EIP = 74.99/month. The Value plan costs $5 MORE per month, and that’s not even considering the fact that you’re losing the juicy reseller discount on the phone if you buy through T-Mobile on a Value plan. Who gets plans without texting? Seriously, I’ve been selling phones for a couple years and I think I’ve done maybe 3 activations with no texting. In comparison, if you include texting the prices are identical but on Value you pay less for the phone up front and your bill goes down before the end of the contract. You’re refuting the savings of the Value plans by pulling out plans that practically no one uses. I’m sorry the plans don’t work for you, but there are surely prepaid options that would be better? Anybody who uses Google Voice or isn’t a goofy teenager or gossipy college student gets plans without texting… My Dad has had a cellphone since the 80’s and has not sent a single text message EVER. Sure, prepaid plans are cheap (much cheaper than Value or Classic) – that’s why I use prepaid SIMs in all my *spare* smartphones. My main smartphone is always going to be a recent model flagship, that’s why I need a subsidy. If you use Google Voice, why the heck would you sign a contract? And that’s great for your dad, but my 94 year old grandfather uses texting. Your dad is in the minority. That statement makes no sense whatsoever. I don’t sign contracts to get service, I sign contracts to get the phones I want at a cheap price, just like MILLIONS of other Americans. Sheesh. This is exactly what I thought… you are the exception not the rule. You have inspired me to research what “voice-blocked data/messaging” plans they offer on the Value side…. You won’t find them on the website. You have to chat with a CSR if you want access to the more obscure plans. Take a look at my reply to dizzle above your post – you’ll see that you can still save $5/month with Classic plan if you want a subsidized high-end phone on a “normal” plan. Being “cheap” is the whole reason I’m with T-Mobile in the first place. If I wanted to burn money I would sign up for Verizon. How much are the shills on this thread getting paid to insist that these so-called “Value” plans are good deals, when they are provably NOT very good deals? I keep giving specific examples of Classic plans that are better deals, but instead of proving me wrong, all these guys can do is say my examples aren’t “typical” blah blah blah. If the Value plans and EIP are so wonderful, why is T-Mobile so ASHAMED of them that they won’t even publish the pricing details on their own website for casual shoppers to examine? If you just wander on the website without an account, the first thing you see are Classic plans. Even if you already have a T-Mo account, you can’t see the EIP details without going into a store. Obviously, T-Mobile knows that these plans don’t “sell themselves” and need to be hyped by a commissioned salesperson in order to sell at all! Value plans typically save the customer money but not always. There is no black or white here. I, personally, am saving $75/mo on a value plan vs. The classic plan I was on. Because I’m now utilizing 3 EIP’S my savings are $15/mo for the time being. I’m happy with this. As for value plans being advertised on their own website, they are, under plans. You then choose whether you want a sim only (byod) etc. There a many options to choose from. Just went to their site and the first advertisement that showed on the page was for value plans. Go to t-mobile.com. click plans. last tab = value packages. Wow they really hid those plans well on the site. Are you for real? I wonder if by classic, UncleFan means a classic grandfathered plan. I have a grandfathered plan that is subsidized, but its cheaper than a value plan WITHOUT any EIP happening. As I mentioned in my original post, I’m including the EIP. Wrong. See the example I gave dizzle below… You can still save $5 a month with Classic under a very common scenario. Show me that scenario. Lol value doesn’t require data. Classic does for smartphone & tax on value is always going to be lower cuz they can’t tax the eip. They can’t tax the EIP because it was collected when the downpayment was made. Dude… The Value 500 min with unlimited text and Unlimited 4G is $59.99 add the $20 EIP for the S3 goes up to $80 the same exacts plan on Classic is 79.99 per month! Unless you are not including unlimited Text. In which i believe it still works out the same! Where are you getting your info?? Where do you see that plan? I looked earlier on the site & didn’t see it. What I DID see is that process have gone up. Not sure when that happened but I just switched to value in November & the plan I have is $40 more now. I know in December they had the plan you mentioned because I was going to move to it. The plan I am referring to is the Individual Value 500 Min plan with unlimited text and Unlimited 4G at $59.99 per month. The same plan with 2gb 4G is $49.99 per month. It is still available. #1) Texting plans are NOT required for smartphones on either Classic or Value plans. #2) The 500 Min Talk Value plan at 34.99 is only $5 cheaper than the 39.99 Classic version of the same plan. #3) The Nationwide Unlimited 4G Value plan at $20 is only $10 cheaper than the $30 Classic version of the same plan. #4) Given facts #2 and #3, the $15 savings of the Value plan is NOT enough to offset the $20/month cost of the EIP on a flagship smartphone like the GS3 or the Note 2. In fact, the Value plan costs $5 MORE per month when you take into account the EIP! Why is simple math and logic so hard for you people to understand? In which you are right… Like i said, if your bring your own device or once you are done paying off the phone it is $55 on value for 500 min with unlimited 4G vs. $70 on Classic for 500 min with Unlimited 4G. I have both classic and value brochures right in front of me at a T-Mobile store, too bad i can’t post pictures on here. You’re one of the very few who will have that problem. who deosnt get text on their plan anyway. And btw, you haveits a 24 month contract. So that means you have to take into acct the last 4 months which you wont be paying the EIP. But like I said your case is rare. It’s still less on Value. He just cant see it. So you are on a GALAXY S3 with 500 minutes,unlimited data…. and NO texting? Are you serious?! You don’t text!? Or did you just try to find a way to talk crap about the value plan. Simply put, value plans takes the phone subsidy off the classic plan in 20 months as opposed to your current plan where it stays that price even after the 20 months. Also you stated that your down payment is the same for value as it is for classic? In my store the value plan downpayment is significantly less than classic. 330.00 for gs3 vs 200.00. I cant speak for every store though. You need to walk out of your store and shop around. There are MUCH better deals from 3rd party resellers on the GS3 with a Classic plan. Nope. I have no idea what you’re looking at. I’m begining to think you’re just trolling around in here. I hope that’s the case because if not you need to freshen up on both your basic reading and math skills. Now look at phone pricing. The Classic price on a G3 is currently 298$ after MIR. 98$ more than the down payments on a Value Plan. So off the bat it is 98$ more. 148$ if you’re an idiot who can’t fill a MIR form. 98$+80$= 178$ less per year! If you break even on the Plans and EIP but are paying a larger down payment on Classic how exactly is that breaking even? You pay more on Classic no matter how poorly you slice it up bud! Now take into consideration that T-mo is now constantly offering rebates on Value as well and have no down payment sales at least three times a year. They were literally just offerring 200$ back on a G3 on the Value plan less than a month after the “Black Friday” sale where all phones had no down payments. If you are shop savvy and time it right you can get a heck of a deal and save an additional 200$. You sir are having trouble with simple math AND reading. I strongly doubt you will even be able to comprehend my response if you even bother to read it. You will just tell me I’m wrong even though anyone with 3rd grade math skills would see I’m correct. And no, I didn’t add a texting plan to either the Classic or the Value plan. If you are paying for a texting plan on an Android phone, you are a CHUMP because you can send and receive unlimited text messages for FREE with Google Voice! actually value individual 500 minutes is $29.99. at the bottom it only says no data 34.99, which means 500 minutes and text is $34.99. value and classic Can NOT be the same price or more as you argue your poin incorrectlyt! you’re arguement is wrong, now stop writing! you’re making yourself look dumb! 35 vs 50 on talk and text plan is the correct amount. or 29.99 vs 39.99 just text! also no one is forcing you to get Equipment installment plan or EIP. You can choice a cheaper phone, pay in full, or put down a larger payment. In fact GS3 in classic retail with 2 yr contract is 358.99 down then you get a rebate to mail in! on value down minimal is $168. that’s a huge different since the remaining $400 is going into a interest free or zero principle loan at $20 per month. paying more down means lower monthly payment as well.intelligent people do save, you’re just plain too stupid to know better! LOL WHAT! NOWHERE on that page does it say 500 Min Talk is $29.99!!! Why are you LYING? You are forgetting a few things. EIP is 20/24 months. 80$ less right there. Your 5$ x 24 months = 120$. 120-80$= 40$ more in two years on Value in your comparison scenario. So far that is! BUT! You are paying a larger down payment on Classic! 200$ down on Value. 298$ down on Classic after MIR. 98$ difference. 98$ – the 40$ = 58$ less for the Value! BAM!!!!! Value wins along with basic math and logic!! WoooHooooo! You will probably say that’s small potatos but whatever. You brought it up. Of course you managed to find one plan that NOBODY ever activates to use in your comparison. Nice job finding that. That’s about all I can compliment you on considering failed to research phone pricing and the terms of EIP. We were literally just offering 200$ back on a G3 on the Value plan less than a month after the “Black Friday” sale where all phones had no down payments. If you are shop savvy and time it right you can get a heck of a deal and save an additional 200$. I haven’t forgotten about the last 4 months, because it’s totally irrelevant. All I care about is 1) The upfront cost of the phone, which is LOWER when you buy from a 3rd party reseller on a Classic plan and 2) The monthly cost of the bill from T-Mobile, which is often LOWER with a Classic plan because the EIP on a high-end phone is often HIGHER than the amount saved with a Value plan. Ahhh. I didn’t catch the 3rd party post. From what I saw it looked like you were talking strictly corporate. Yeah, not much anyone can say about Walmart selling penny Galaxy S3’s. But in a strictly corporate store situation Value always works out cheaper on activations and most upgrades. There really isn’t a way around it. What you are not understanding is that your scenario is not that common. Most people will not have the same service lever you need. If the Value Plan does not work out for you, that’s fine. But the Value Plan does work for the majority of people. One thing you have to understand is that some people (like Myself) will pay off the EIP as soon as they can as opposed to making all 20 payments. The moment you are done with the EIP payments, your monthly bill is lower, also, you do not need to buy your next phone from T-Mobile directly. That is the advantage of the Value Plans. You can get your phone where ever you like and bring it to T-Mobile without signing up for an additional 2 year contract. For a new customer signing up. If your already a VP customer you can swap phones out all day long without contract extensions. but you still get stuck in a 2 year contract either way! I know exactly what you are saying. I have a ‘grandfathered’ classic family plan w/4 lines, 3 of which are data. I have no idea how I am going to afford buying 4 phones out right when it’s time to get new phones. When you add the additional EIP costs for 1 data phone it’s bad enough, but I think I’m going to have at least 2 sometimes 3 on my bill. And before anyone says anything about not upgrading theirs phones every 2 yrs. DON’T. There’s not one of you out there who likes to keep a phone more than 2 yrs. much less 1, since we all know that the shelf life a phone is usually 1 yr. before you’re itching to get your hands on the newest phone(s) on the market. The one thing I have to disagree with you with though is the subsidies. You can’t call your EIP costs a subsidy, cause no one else is covering a portions of the phone costs anymore, it’s all on you. its simple, you pay off your phone in 20 months…with classic you get an upgrade every 22 months so it pays off. Not to mention that when you break down 3 high end devices with data at $20 a month for 20 months u break even to what you pay now on classic with 3 smartphones. Yea… Not sure if you are adding things up correctly, value plans on a family plan are a minimum of $20-$40 cheaper than classic plans, additional lines are as low as $5 a month. Not sure where you are getting your info from but Value Plans are a win win situation! All the Value plans I’m looking at cost $10 or $15 less than the equivalent Classic plan, therefore once you add in the $20/month EIP for a high-end smartphone, the total monthly cost is from $5 to $10 cheaper with the Classic plan. The only way you end up $5 cheaper than Value Plans is if you don’t have text, but even after paying off the device it will be $70 vs. $55 so value still wins. Especially if you bring your own device! staying classic is like hoping you find a good deal on a S3 in which after the move to Value, we don’t know what the third party company’s are going to do about discounted devices, they might switch to offering discounted retail prices for renewing your contract and T-Mobile still pay them out for the contract renewal. Than what??? If I were bringing my own device, I would be on the $45 Straight Talk or $30 Monthly4G plan, because those are MUCH cheaper than any equivalent Classic or Value plan! You do raise a good point about what happens next at 3rd party retailers. Nobody knows. Dammm a whole Year more of Loses wow what a shame so much for catching sprint..
Yeah but I know so many analysts who can’t make accurate predictions to save their lives. They base everything on current trends and have no way to predict what an impact the iPhone or the move to Value Plans will have, whether it be positive or negative. I always take everything analysts say with a grain of salt. If CEO said that subscriber numbers “should be positive” then maybe anticipates a least T-Mobile customer at the end of the year. That’s a high bar. NETWORK! YOU HAVE 2g EVERYWHERE! THESE PEOPLE HAVE NO CLUE. Sign up 5 lines and get Note II’s on Value EIP’s then try to cancel in 3 months- Check that bill out!! You can’t cancel these plans without a small loan. Who signs a contract with the sole intention of canceling in a few months? T-Mobile’s goal is not to make it easy to cancel. I have a loyalty plan through tmobile, got that when I threatened to leave after my contract was up. It is cheaper than the classic plan, but still can get subsidized phones. I have 2 lines and share 600 minutes, we RARELY go over 400. I have a smartphone and the other line is a regular phone w/no data and text. I have no limit on my data and use it a lot more than minutes. This loyalty plan costs $49.99 (2-lines) + $24.99 data/text (for my smartphone) = $74.98. I also have a corporate discount of 12% on top of that which works out to $66 per month. The value plan (w/400 more minutes which i do not need) w/my discount (if they allow it) is the same ($49.99 + $20 data + $5 text = $74.98 -12% = $66). I am not making any errors, I am simply writing down my monthly bill vs. a sample value plan for 2 lines from tmobile’s corporate discount site. How is paying full price for a phone with monthly EIP on a value plan going to benefit me? Maybe I should pay $200 for a phone now before they stop subsidized pricing.